Email retention is now a global problem. Governments and regulators are requiring that organizations save their email in secure archives. 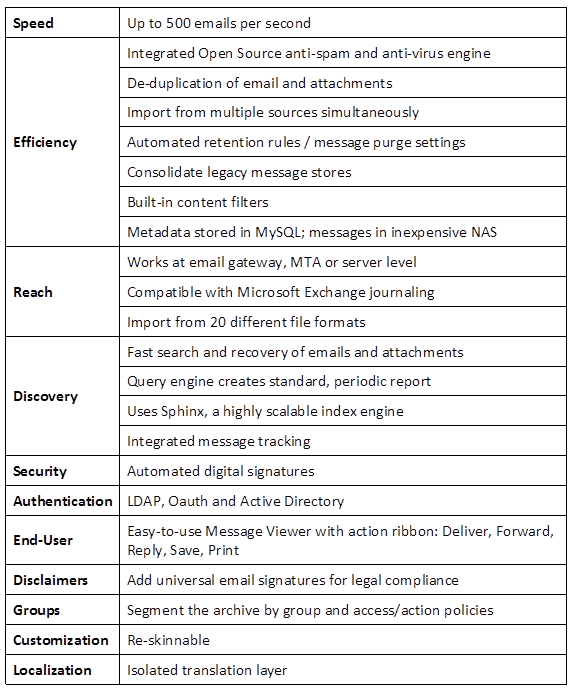 Mailspect Archive helps enterprises comply with email archiving regulations around the world. Mailspect Archive’s top ten design goals are: (1) work with any email server, service, MTA or gateway; (2) file metadata separate from content to effect fast search and discovery; (3) index virtually any text file type to support universal search; (4) manage users through LDAP directory integration, (5) compress the data store up to 80% through de-duplication; (6) block computer viruses and spam from entering the archive; (7) work with commercial and Open Source Linux distributions and OS X; (8) offer robust message tracking and system monitoring to facilitate systems management; (9) facilitate the import of more than 20 file types to support the consolidation of legacy mail stores; and (10) make the system easy to install and maintain. Mailspect Archive also offers content filtering options that can be used to sort relevant email from personal/irrelevant email. Content filtering can further help reduce the size of the archive and save money. Content filtering can also be used to configure queries of the Archive that will trigger periodic, automatic reports via email based on key or offensive words. Mailspect Archive supports Microsoft Exchange journaling and .PST import (with a third-party parser). For the end-user, Mailspect Archive can be accessed by web browser and his or her normal email address and password. End-users can use the archive to find and recover lost email. End-users have access to the following individual and bulk commands using the Action Ribbon in the Message Viewer: Deliver, Forward, Reply, Save to Desktop, Export, Print, Add to Whitelist, or Add to Blacklist. Deploy Mailspect Archive on Amazon Web Services as a private cloud or on your own on-premise gateway or server. Mailspect Archive works with any email system whether it is Open Source, Windows, Linux, or Mac OS X. Mailspect supports major products like MS Exchange Journaling, Lotus Notes, or IMAP email servers such as Postfix, Sendmail, Qmail, CommuniGate Pro, Scalix, Zarafa, Zimbra, Axigen, Open-Xchange and others.